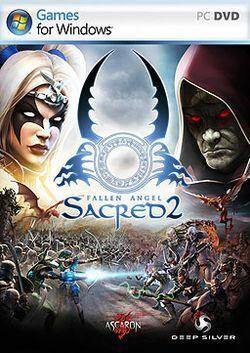 Sacred 2: Fallen Angel is the second full game in the Sacred series. It is a prequel which takes place 2,000 years before the events of Sacred. Like its predecessor, the game takes place in a fantasy setting. A new game engine means that the game is rendered in perspective correct 3D, whilst retaining the viewpoint found in older isometric games. Video game designer Bob Bates has been involved in its production, the game also includes a video sequence with the power metal band Blind Guardian, who also made a theme song for the game. The Windows version was released in late 2008, the console versions were delayed until 2009 with the discs being pressed in April 2009 for a May release. In April, the developing company Ascaron, went into administration citing the extended development as the reason.